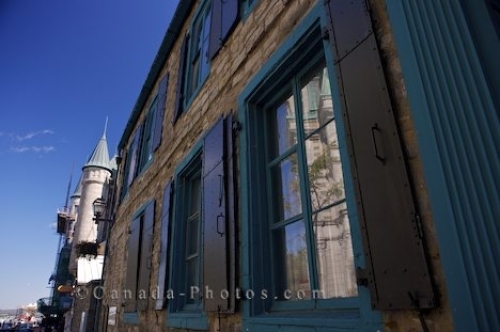 While in Old Quebec in Quebec City, Canada be sure to stroll by the Maillou House and admire the historic walls and windows on the exterior of this building. Built in the 18th century, the Maillou House is situated near the Chateau Frontenac where the towers rise above this ancient building. The Maillou House, La Maison Maillou, a National Historic Site, along Rue Saint-Louis, and the towers of the Chateau Frontenac, Old Quebec, Quebec City, Quebec, Canada. UNESCO World Heritage Site. Picture of the windows on the 18th century Maillou House and the towers of the Chateau Frontenac in Quebec City, Canada.